← My grandson is born! Do you celebrate religion-based holidays where you are in the world? If so, do you feel you have the freedom to call that holiday with the name you have known for long about? If not, when or why did a restriction begin to occur? How do you approach such limitation? I am not at all attempting to open up a highly controversial topic as far as United States are concerned. This issue to me has most recently become a matter of severe frustration by some people I care about. I don’t celebrate any religion-based holidays. When growing up, my family had always prepared special meals and as many gatherings among family and relatives as possible but to us all, they were secular occasions to enjoy the togetherness. Many of my friends and acquaintances, however, do. Please look at the image I posted on top, with three world religions’ visual symbols. We know too well these are not the only ones. Nor is there one single mystical tradition. As we are aware, spirituality, too, comes in different extent and forms as well as intents. Some are religion-based, some rather personal, meditative, transformational, and serve purposes perhaps too private to be open for public discussion. Without having any association whatsoever to an institutionalized world religion. 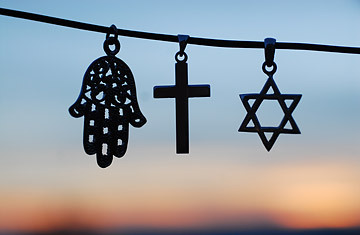 So, I wonder, with all the variations of human belief in an ultimate being, or the ultimate being, why is it that we obsess over a name when it is time to celebrate a religion-based holiday? Such as right now. What do we fear when a person calls it in her/his congratulatory messages this or that name in her/his want to mark those times as they wish? I leave you with only the beginning of what I hope to turn between us in to a discussion of our personal choices in the face of religious holidays; choices not only to celebrate them as one wishes to but also to name them out loud what they symbolized for quite some time. My wishes to you, as always, go far beyond any holiday-prompted occasion. I want to hope we will unite instead of divide in the purity of the heart. It should not be an issue at all, but it has become in recent years, because people are ready to outrage about anything and everything, more so in social media. People just use random topic to go beserk these days. I have no problem in wishing people by the specific name of the festival, specially the religious one. I feel wishing happy holiday is very bland phrase. I wish my all my friends Happy Eid, muslims or non-muslims, same way as I wish all of them Happy Diwali or Happy Holi (Hindu festivals) or Merry Christmas. I do not get how it can be considered political incorrect. And why would a person get offended by greeting? It is just ridiculous. My definition of secularism is equal respect for all religions. I couldn’t agree with you more, dear bhuwanchand. I can understand a political construct opting for a neutralized reference in an attempt to avoid offending another cultural entity. But as far as any ordinary people are concerned, everyone should be free to wish for and/or celebrate any religious holiday without worrying about being pc or not.